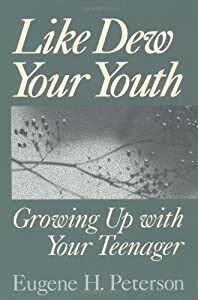 There's a great book by Eugene Peterson titled Like Dew Your Youth: Growing Up With Your Teenager. When I read it, I felt like I'd won a lottery. I knew I wouldn't win another one again, but I kept reading, hoping to win more gems of wisdom that are actually priceless to parents. This was the book a parent of teens needed to find. Where was it through the first of the parenting adolescents years? Now that all my children are teenagers (or just about), this book could not have come into my life at a better time. What is so good about a book originally written in 1976 and re-published at least twice in the 80s and 90s? At a time when I had been groaning about teenagers, wishing somehow to fast forward life to "safety" into adulthood, fears of teens getting into various forms of trouble, I needed this book to come into my life as the voice of a father putting his hand on my shoulder and saying . . . The infant is a gift of God by which we are given renewed access to the forms of childlikeness through which we receive our Lord and enter the kingdom of God. But the adolescent, though not so obviously, is no less a gift of God. As the infant is God’s gift to the young adult, so the adolescent is a gift to the middle-aged. The adolescent is “born” into our lives during our middle decades (when we are in our thirties, forties, and fifties). In these middle decades of life we are prone to stagnation and depression — the wonders of life reduce to banalities and the juices of life dry up . . .
And that, says Peterson, is when God brings the gift of adolescence into our lives through our teenagers. It's easy to call a baby a gift. It ain't easy to call teenagers a gift, but that's exactly what teenagers are. Pure energy and life flow through the veins of teenagers, however erratic their emotions and hormones may be. At a time when life turns grey and forty-ish parents are prone to mid-life crises and sluggish metabolisms, God at the right time gives us the gift of teenagers. But there's much more to this--a gift for what? I'll post on what this gift is for tomorrow.